The "Description des douze cesars" has not been seen publicly for nearly a century, and yet it ranks as one of the late masterworks of the famous court painter and illuminator Jean Bourdichon (1457-1521), who probably created it in the final years of his life to fulfill a commission from his last patron, King Francis I of France. 216 x 144 mm. – 34 leaves, with 16 full-page miniatures of the emperors. 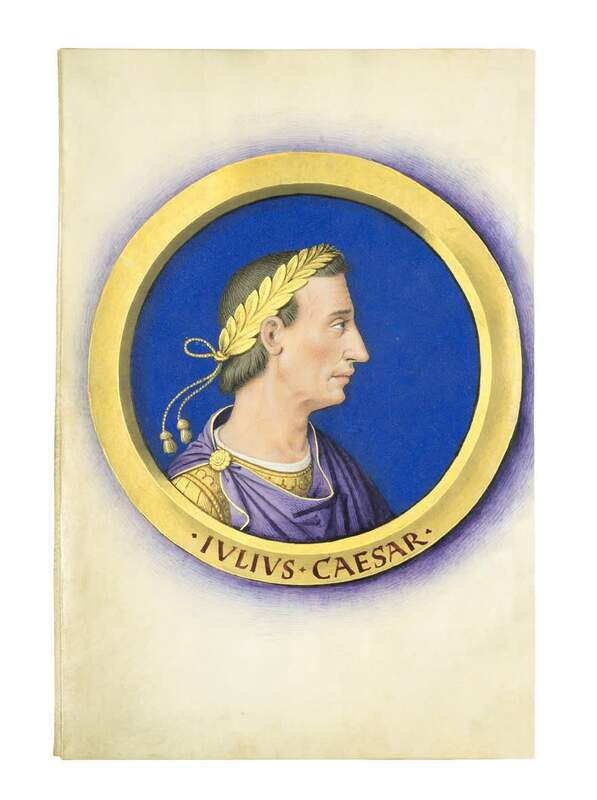 The text contains concise French biographies of the first sixteen Emperors to rule Rome, beginning with Julius Caesar (r. 49-44 B.C.) and ending with Antoninus Pius (r. 138-61 A.D.). Each life is accompanied by a portrait medallion of the corresponding Emperor, painted by Bourdichon in the monumental, lavish style typical of his late works. This manuscript is in fact one of three near-identical variants of the text illustrated by Bourdichon, and the last to remain, until now, hidden from the eyes of scholars. While the exact circumstances that led to the production of these three versions of one text cannot be ascertained with certainty, it has been suggested that the works were intended as diplomatic gifts, perhaps related to the festivities surrounding the meeting on the Field of the Cloth of Gold, a decisive diplomatic encounter between the young monarchs Francis I and Henry VIII in June of 1520. The elegant text and extremely high-quality vellum of the Douze cesars manuscript, paired with the superlative quality of its illustrations, indicate that the book was created for a specific occasion, perhaps as a diplomatic gift. The briefness of the texts—the shortest, for Otto, being only eleven lines in length—demonstrates that the work was not intended for study or private reading, but rather for aesthetic pleasure and semi-public display. Indeed, the texts themselves, highly abridged, loose adaptations and translations into French of Suetonius’ De vita caesarum, are unknown outside the three variants of the manuscript. Bourdichon’s rendering of a suite of Emperors in profile breaks from traditional representations, lending the portraits an air of charm and vibrant verisimilitude. This work is now in the collection of the Bibliothèque nationale de France in Paris.